Today, the maiden flight of a new military aircraft in Russia is a major event — and this sense of occasion is heightened even more when the aircraft is a completely unknown type. The maiden flight of the Sukhoi S-37 was, perhaps, the most important event in Russian aviation so far this decade. It took place at 3:09 p.m. on 25 September 1997, at the LII (Lotno-Issledovatelskiy Institut) flight test centre airfield, Zhukhovskii, near Moscow. Igor Votintsev was at the aircraft’s controls during this 30-minute flight. The new S-37 was accompanied in the air by a (two-seat) Su-30 flown by Yevgeny Frolov, with a photog-rapher in the backseat, recording the event. General designer Mikhail Simonov and his deputy on the S-37 project, Mikhail Pogosyan, were watching from the ground. Such a prestigious event seems worthy of celebration, but the Sukhoi bureau seems to be follow-ing a curious policy of being ‘eager yet afraid’. General information about the aircraft is not secret, but neither is it available from the company. No press releases have ever been prepared and little official comment has been made. Photos of the new aircraft were made available to only one publication, the monthly Russian magazine Aviapanorama (which is reportedly produced with considerable support from the Sukhoi company, while not being directly tied to the bureau). Copies of these photos are hard to obtain. Two years later, issue 3—4/1996 of Russian Air Force Herald (Vestnik Vozdushnogo Flota) published a short notice about a session of the Military Council of Russian Air Force held in February 1996. The most interesting part of this article was a photo presenting Piotr Deynekin and Mikhail Simonov at a table with two aircraft models. One of them was the (now) well known Su-35 ‘Flanker’, but the other was quite different. The small size and poor reproduction of the photo made exact analysis difficult, but it was clearly a fighter with for-ward-swept wings. Its side number — ‘32’ — indicated that it was the S-32, although its shape had changed since the first model was presented to the French journalists. It was no longer a canard but a ‘tandem triplane’ — a favoured Russian configuration blending both canards and rear tailplanes. At the turn of 1996 and 1997, some Western sources reported preparations for the maiden flight of the S-32. This caused much consternation in Russia where, after rapid discussions behind closed doors, it was decided to take ‘countermeasures' by changing the aircraft’s designation to S—37. 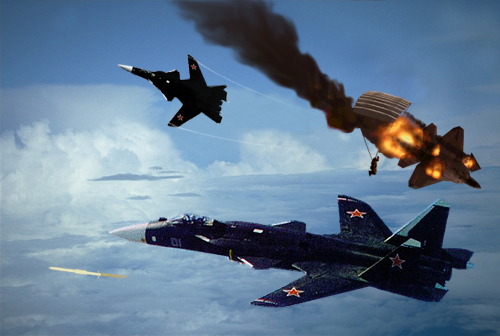 Spokesmen from Sukhoi could then firmly declare that the S-32 aircraft did not exist. Nor was the S-32/S-37 at such an advanced stage of development, at that time. The S-37 was hurriedly prepared for presentation at the MAKS ‘97 exhibition, at Zhukhovskii, in August 1997, on condition that the aircraft be shown in flight. Although the aircraft began ground tests in mid—July and performed high- speed taxi trials, it did not fly and was not ‘ready’ for the show. Recent information from US sources alleges that as early as 1982, i.e. two years before the maiden flight of the Grumman X-29 (America’s well—known FSW tech-nology demonstrator), US satellites photographed a similar aircraft at Saki (Syberski) air base in the Crimea (now part of the Ukraine). This mystery machine was report-edly a single—engined cxperimental FSW design, built by Sukhoi. The aircraft, codenamed ‘Syb—A’ (for Syberski), was until recently quite unknown and no photographs of it have been seen in public. Several Russian sources are sceptical that it ever existed. They point to its supposed location at Saki, the Soviet naval aviation test centre. In August 1982 Saki hosted the ski- jump take—off trials of the MiG—27, MiG-29, Su-25 and Su-27. It is very doubtful that any tests of such a radical new aircraft could have been carried out at the same time, given the very early stage of Soviet naval aviation ambitions and expe-rience at that time. At the same time, however, TsAGI did comprehensively explore the behaviour of FSW air-craft in the wind tunnel, over a wide range of speeds (from Mach 0.2 to Mach 2.0) and at various angles of attack (up to 800). Early TsAGI FSW models were based on the MiG—23 and similar work was undertaken at Novosibirsk, on a modified Su-27. Performance was optimised for transonic speeds (Mach 0.8—1 .3) for optimum air combat handling. Within this speed range, the drag and lift:drag ratios of an FSW are more advanta-geous than those of conventional wings (below this range both wings are equivalent, whereas above it a conventional wing is better). Air-flow is directed inward along the wing, moving the centre of pres-sure inward also. As a result, the wing is less prone to bending, allowing the wing design to use a higher aspect ratio, with less resul-tant drag. At high angles of attack, the lift generated by an FSW is greater than a conventional wing and the effectiveness of ailerons is better, although the effectiveness of the tailplane is diminished. Taken as a whole, these factors can pro vide better manoeuvrability, greater range, and shorter take—off and landing runs. Russian work on such FSW designs dates back to the mid— 1 940s and was entirely based on captured German technology. The concept was directly inherited from the Junkers Ju 287 bomber, which was captured at Dessau. The first four-engined Jo 287 VI prototype flew on 16 August 1944. It made 17 flights before World War II ended, but was damaged as the result of an air raid. The Russians continued development of the uncompleted six-enginedJu 287 V2, with the aid of imprisoned German designers, at the Junkers plant. In January 1946, they began assembly of the experimental aircraft (Entwicklung Flugzeug) EF-131 using parts built for the Ju 287 V2. It was a three—seat aircraft with wing swept forward by 19deg 50min and with considerable dihedral. It was built at Dessau and immediately dismantled to be sent to the Soviet Union — aircraft design and construc-tion were forbidden in occupied Germany, as the Russians were afraid their German test pilots might ‘forget’ to land in the Eastern zone. The maiden flight of the EF-131 took place on or around 23 May 1947 at Stakhanovo airfield (now Zhukhovskii) with German pilot Paul Julge at the controls. For several months it stood idle in the hangar before being transferred to Moscow’s other airfield, Tioplyi Stan, but flight tests were not contin-ued and eventually the order was given (on 21 June 1948) to stop the work on EF-131. This decision was due to a follow-on design, EF-140 bomber, a mod-ification of EF-131 with Alexander Mikulin AM-TKRD-01 turbojets (the EF-140 was built of parts prepared for the second prototype EF-131). On 30 September 1948, the EF—140 made its maiden flight and in the course of testing achieved 488 kt (904 km/h; 561 mph) and a range of 2000 km (1,242 miles). A reconnaissance version of the EF-140, dubbed I 40-R (doing away with the Ger-man abbreviation ‘EF’), with VK-1 engines developed from the British Rolls-Royce Nene, was flown on 12 October 1949. However, after its fourth flight, tests were stopped due to strong (and insoluble) vibra-tions in the wing. During the 1980s, TsAGI carried out a great number of experiments. Its first simple models became more and more complex. 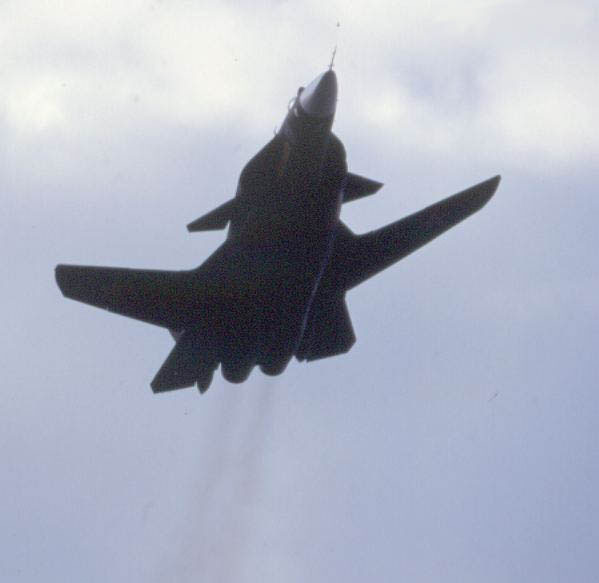 Initially, the tailplanes were moved forward to form a canard layout. Later, large leading-edge wingroot exten-sions were introduced which, together with the canards, prevent-ed stall of the airflow over the wings, improving the lift at high angles of attack. Finally, TsAGI recommended a fighter with an FSW, substantial leading-edge root extensions and several effective control surfaces (the canards, elevons and flaps behind the wing), as well as vectored—thrust engines. This was the first configuration of the S—32, and it reappeared in several subsequent designs of other aircraft. From the start of work in 1983 until 1988, the Soviets intended to build only an experimental aircraft, like the X-29. 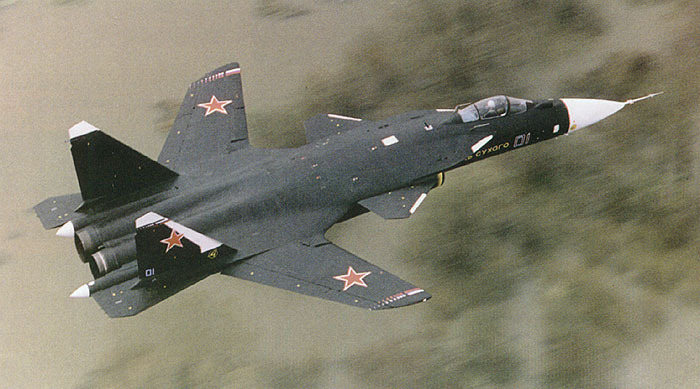 After 1988, however, Sukhoi, and particularly its ener-getic general designer Mikhail Simonov, saw the S-32 as a combat aircraft: the fifth—generation ‘heavy fighter. A weapons system was developed for it and elements of stealth technology introduced. 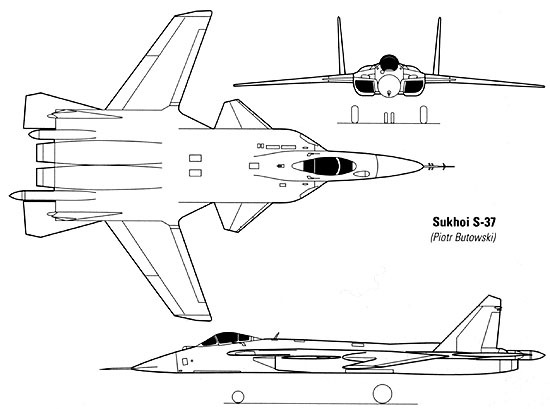 By 1994, Sukhoi was ready to start work on a prototype. Aerodynamically, the S-37 is one of the most complex aircraft in the world, with large ogival strakes above the air inlets, canards, for-ward-swept wing, leading-edge root extensions and twin vertical and horizontal tails. The wing has been made from 90 per cent com-posites and is swept to approxi-mately 18deg. Its high-lift devices include ailerons, slats and trailing— edge flaps. The trapezoidal canards are much larger than those of the Su-35/Su-37 (perhaps twice their size). The rear ‘control’ flaps of the original S—32 design were trans-formed into swept (by about 750) tailplanes, smaller and shorter than those of the Su-27. 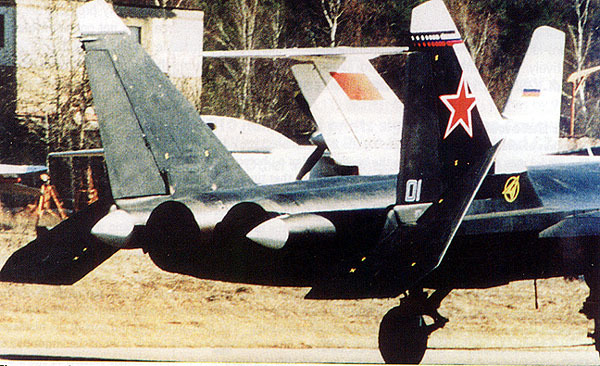 Tailfins are similar to the Su—27’s but are canted outward slightly, not parallel. The fixed air intakes have a circular section. The landing gear is the same as the Su-35/Su-37. Two fairings protruding to the rear on both sides of the engines (the star-board one is much longer) contain electronic equipment. It is likely that one of these fairings can accommodate a rear-looking radar, with ECM equipment in the other. At present it is assumed that a spin recovery chute is fitted in the longer ‘sting’. Very similar ‘stings (also of unequal length) were on the model of the S-54 light fighter shown at Paris in 1997. There is quite a resemblance between S—37 and S-54, and perhaps an FSW development of the latter is on the drawing board. Mikhail Simonov became very attached to the ‘tandem triplane’ configuration applied to developments of his Su-27, and — together with the FSW — also introduced them to the unbuilt S-47 light attack aircraft and to the S—84 and S—86 executive aircraft designs. Sukhoi has not disclosed any hard data for S-37, but some ‘con-trolled leaks’ have been allowed. This information should be taken with some reservations. Only the aircraft’s dimensions are certain: 22.6 m (74 ft 2 in) in length (with-out pitor tube) and 16.7 m (54 ft 9.5 in) in span. The S-37 is too large for the standard shelters in Russian fighter bases and has been designed with folding wings — the wing spans of the largest current Russian fighters, MiG-3 I and Su-27, are 13.5 m (44 ft 3.5 in) and 14.7 m (48 ft 3 in), respectively. The folding wings may also faeilitate the possible use of the S—37 as a carrierborne aircraft. Mikhail Simonov certainly intends to adapt S-37 for use on aircraft—carriers as a successor to the Su-33 (Su-27K). The S-37 has a low approach speed and flat approach attitude, conducive to carrier operations, thanks to its wing eharacteristics. The normal (i.e., typical combat mission) take—off weight quoted as 24000 kg (52,910 lb) is an underestimate; it cannot be the case that the S—37 is lighter than its smaller forerunner, the Su-37. The take-off weight of the latter, in a normal air—combat con-figuration, is 25670 kg (56,591 lb) including 1400 kg (3,086 lb) of weapons and reduced fuel. Twenty- four thousand kilograms was prob-ably the S-37’s weight on its first flight, and normal take-off weight will be approximately 27000- 28000 kg (59,524-61,728 lb), while the maximum weight certainly exceeds 35000 kg (77,160 lb). The given figures of 2200 km/h (1,367 mph) for speed seem exag-gerated, however. The S-37’s fixed air intakes should limit its speed to 1800-2000 km/h (1,118-1,242 mph). No information about the range of the S—37 is available but it certainly exceeds 4000 km (2,486 miles). The aircraft has no air—to—air refu-elling system as yet. The next problem to be solved by the aircraft designers is the acquisition of engines. Taking into account the estimated normal take-off weight of 27000-28000 kg (59,524-61,728 lb), and the known requirement of the Russian air force that the thrust—to—weight ratio for its next—generation fighter should be 1.3:1, the total thrust of S-37’s engines should be 344.2- 356.9 kN (77,393-80,249 Ib). According to the ‘quasi—offieial’ information, the total thrust of engines installed presently in the S-37 is “25 tons” (245.1 kN; 55,110 lb) — which seems laeking. Two new-generation engines are available with the thrust required for the S-37’s needs. The first is the Saturn AL-41 F, as provided for the MiG 1.44. This engine is rated at about 176 kN (39,575 lb), and has a flat two—dimensional vee— toring (+15deg/-15deg) nozzle. Fitting this engine to the S-37 would follow long years of Sukhoi tradition: Saturn engines have been applied to the Su-27 (AL-31F), Su-17 and Su-24 (AL?21F) and, before that, to the Su-7, Su-9 and So-i 1 (AL-7F). However, tradition is not an over-whelming argument; MiG aireraft have been traditionally equipped with Salyut engines, but for the 1.44 the AL?41 F was ehosen. Salyut also developed an engine similar to the AL-41F. It is the 176-kN (39,575-Ib) vectored-thrust R-79M, a version of the R-79V-300 applied to the Yak-41 VTOL fighter 10 years ago. Both these engines, R-79M and AL-41, have an equal chance in the future with the S-37. For the time being, neither is available to the S-37 designers, as both are still undergoing ground and air tests. 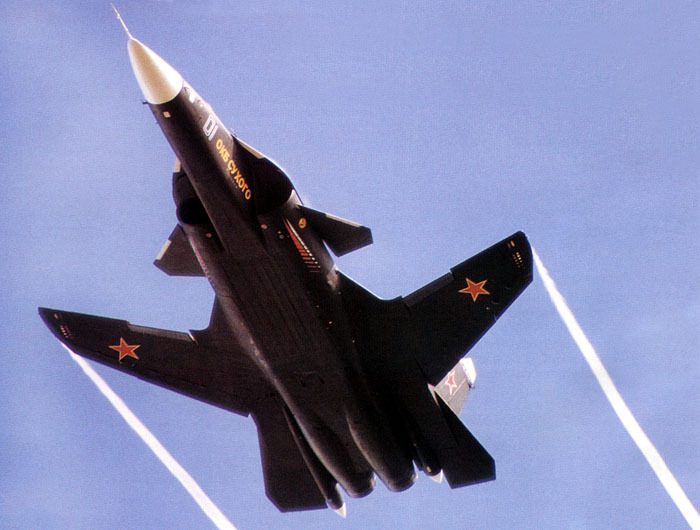 The S-37 prototype was fitted with the most powerful of extant Russian fighter engines, the MiG-31’s Aviadvigarel D-30F6, rated at 93.2 kN (20,956 Ib) dry and 152 kN (34,177 lb) in after-burner. These engines are far from ideal and are incapable of vectored— thrust flight testing. 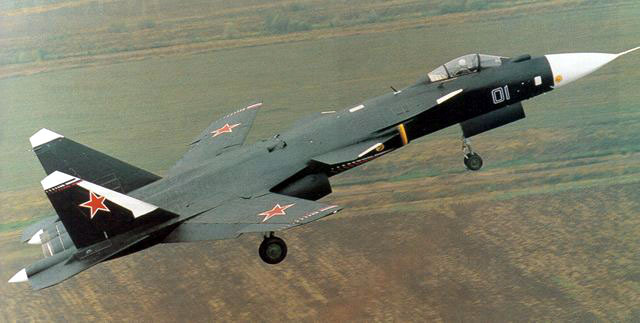 Some 14 years ago, specific requirements were set out by the Soviet air force for its fifth—genera-tion fighter. The new aircraft must have an all—aspect close air combat capability (with the ability to attack targets in any position, including to the rear); a ‘multi-channel’ medium— and long-range engagement capa-bility (including simultaneous attack against several separate BVR targets); reduced radar and infra-red signature of the aircraft and its systems; supereruise; automatic operation of all board systems; autonomy of action provided by new navigational systems and tactical displays in cockpit; and short take-off and landing performance. The S-37 (with target engines) will meet the air combat, super— cruise (Mach 1.3—1.5) and take—off and landing requirements. With the right engines, the S-37 will be able to outmanoeuvre the Su-37, which is the current, unequalled, close—in air combat benchmark. The S—37 is ‘stealthier’ than any other flying Russian aircraft — but it is not a ‘stealth’ aircraft and yields in this respect to F-22 and (proba-bly) to 1.44. It has none of the substantial signature—reducing air— frame features built into the F-22 (at enormous cost) from its begin— ning. Nevertheless, care has been taken with sonic essential factors for reducing the radar signature. The S—37’s air intake trunks are curved in order to screen the engine compressors. Basic arma-ment is to be carried conformally under the fuselage, but not inside a weapons bay like the F-22 or 1.44 (a production version of the S-37 may yet have an internal bay). The forward—swept wing itself is a stealthy feature as radar waves are reflected from its leading edge into the fuselage and not back into space. The airframe skin is made of radiation—absorbing material (in this technology the Russians have been considerably successful, reportedly), and the composites used for struc-tural parts are another means of reducing the radar signature. Sukhoi officials say that the effective radar cross-section of the S-37 is one order of magnitude (i.e., 10 times) less than that of existing Su—27s. The S-37’s infra—red signature may be reduced by cooling the exhaust flow from the engines, and screening the nozzles. None of these solutions has been applied to the S-37 prototype for the time being, but they are certainly intended for the target powerplant. Remaining air force require-ments concern the equipment rather than the aircraft itself. The weapons system of S—37 is still an unknown, and has certainly not yet been installed in the aircraft. The arrangement of the weapons control system will be probably similar to that of other Russian fighters, both extant and under design, i.e., the main radar will be combined with a small rearward—looking radar, with an electro—optical sight/IRST and a helmet-mounted sight. Several fire control systems and radars are eligible for the S-37. It will certainly be equipped with an electronically scanned phased—array radar. Among the Russian radars of this class, the closest to operational readiness is the Su—37’s NOl IM unit. The NOl iM is developed by NI I P (Nauchno—Issledovatelskiy Institut Priborostroyenya), based at Zhukhovskii. This radar can track both air and surface targets, has automatic terrain—following and avoidance modes, and surface mapping capability. It can simultaneously track (at least) 15 air targets and engage four to six. Detection range against a target of 2 m^2 (21.5 sq ft) radar cross—section is quoted as 80— 100 km (50-62 miles) in a head-on engagement or 30-40 km (19-25 miles) in a tail—chase. The N01l IM can be combined with the small N012 rearward—looking radar, for self—defence. A longer-term solution comes in the shape of the N014 radar for the MiG 1.44, developed by the same NIIP team. No details of its perfor-mance or development status are known. Radars built by the Moscow-based Phazotron (NIIR) firm should be also considered. Although the Su-27 and its deriva-tives are traditionally equipped with NIIP radars, Phazotron is actively trying to break this monopoly. It is offering the Zhuk-Ph (Beetle) phased-array radar for the Su-35/Su-37, and the Sokol (Falcon) radar is proposed for the future S-54 light fighter. It is prob-able that some version of the Sokol will be applied to the S-37. The Sokol developed for the S-54 will have a detection range of 180 km (112 miles) against a target of 3 m^2 (32 sq ft) cross—section and will be capable of tracking 24 targets simultaneously, and engaging six. The basic weapons set, including (probably) R-77M (AA-12 ‘Adder’) medium—range missiles and R—73 (AA-l I ‘Archer’)/R-74 short- range missiles, will be carried conformally under the fuselage. If necessary, more weapons can be carried on external hardpoints. The S—37 is fitted with a gun port (probably for a GSh-301 30-mm cannon) in the starboard strake, above the inlet. As in the case of the Su-37, the warload will be 800() kg (17,637 lb), or more. The aircraft will be able to carry all types of existing and future Russian air—to—air weapons (such as the huge KS-172/AAM-l long-range hypersonic AAM) as well as air-to- surface missiles, such as Kh—31 (AS— 17 'Krypton’), Kh-35 or the Kh-41 (3M80 Moskit). In its first phase of tests, completed on 27 November 1997, the S-37 made eight flights — each time flown by Igor Votintsev. It was reported that the surface area of the tailfins was insufficient and that they will be increased by adding inserts at the tailfin roots (like the changes made to the Su-35 com-pared to the Su-27). In April 1998 the S—37 made another series of (at least three) test flights, with its configuration unchanged. Modified tailfins, and production-standard engines, are now expected to be fitted to the second prototype. The S-37 remains an enigma. At first, the Russian press presented it as “the world’s most modem fighter aircraft, equal to or even better than the F-22” and “delayed in respect to F-22 by two weeks only” (com-paring the first flight date of the S-37 with that of the first pre—series F-22A). This enthusiasm soon abated. It was stated that the “S—37 is not yet a fighter aircraft” and that neither its avionics nor engines were ready. The forward-swept wing itself needs more trials and, perhaps, some design changes. The strongest blow came from the military. The official presentation of the S—37 at Zhukhovskii, on 18 October 1997, was attended chiefly by ‘third—class’ officials, with General Victor Chirkin, deputy chief of the air force’s test centre, as the senior officer. On 29 November, Krasnaya Zvezda (Red Star), the newspaper of the Russian Ministry of Defence, published a certainly not incidental article which effectively said that the air force was not interested in the S—37; it read, “The Sukhoi’s novelty is as an experimental aircraft and there is a long way to go before it will be transformed into a combat one,” and “a great technical and econom-ical risk” is involved in making it a prospective fighter. The author of this article went on to say that comparing the S-37 with the F-22 is as inaccurate as comparing the experimental X-31 with the com-bat-capable Su-37. 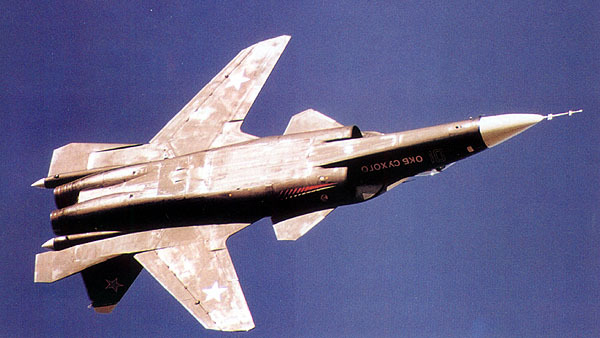 As a final blow, more accurate dates from the F—22 programme history were included, such as the 1990 maiden flight of the YF-22 — not two weeks but seven years before the S-37. The comments of the Sukhoi company are also restrained. 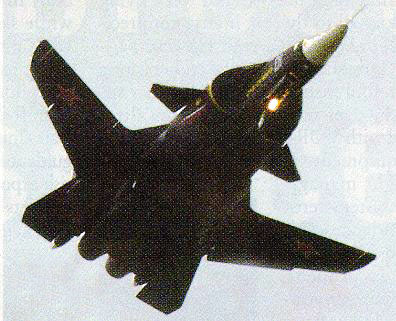 During the Dubai air show in November 1997, Mikhail Simonov stressed the experimental character of the S-37 as a progressive step in exploring post-stall manoeuvrability after the advances of the Su-37. He also confirmed that the company does not receive any financial sup— port for the programme from Russian air forces. Under such circumstances, will the S—37 ever perform as a true combat aircraft? Certainly, at pre-sent, it is much more than a pure proof-of-concept aircraft. Work on the avionics system is already well advanced. The most important question concerns money. Mikhail Simonov could afford to build the S-37 ‘shell’ using funds received from export contracts for Su-27 and Su-30, but now external sup-port is necessary. The S—37 project is fully supported by President Boris Yeltsin’s aviation and space advisor Air—Marshall Yevgeniy Shaposhnikov (former comman-der-in-chief of Soviet Air Force). The ‘hostile indifference’ of the air force may change following the dismissal of C-in-C Piotr Deynekin, who was an opponent of the S-37. Furthermore, Yuri Klishin the chief of armaments for the Russian air force recently said that he does not think the S-37 is a ‘dead end’. However, the repeated changes of commanders and advisors in Russia are occurring much faster than the development of any aircraft. More-over, nobody knows how the struggle for the control of the Sukhoi company and its associated factories, waged by the two big Russian financial groups ONEK-SlMbank and Inkombank, will affect the fate of the S-37. Even a merger of MiG and Sukhoi has been postulated, which is an indi-cation of how the fortunes of MiG, once Russia’s premier combat air-craft manufacturer, have fallen. For a long time the (Western) press wrote exclusively about the MiG 1.42/1.44, passing over the S-37 (S-32) — but now it is the 1.44 that is in danger of being for-gotten. As a result, ANPK MiG and its newly appointed general manager Mikhail Korzhuyev are pushing hard to get their fifth-gen-eration fighter into the air. The prototype MiG 1.44, also dubbed the MFI (MnogoFunktsional’nyi Istrebirel/multi—function fighter), has languished in an unairworthy condition at Zhukhovskii for sev-eral years. At the time of writing (early 1998), a first flight is finally in prospect — perhaps in time for the Moscow Aerospace Salon in August 1998. It remains the case that if any of Russia’s ‘fifth—generation’ aircraft ever enter service, it will probably be the MiG aircraft. Despite appearances, it remains the more advanced design and meets, without exception, all conditions required by the Russian air force. Anatoliy Belosvet, of ANPK MiG, called the 1.44 the “only Russian fifth- generation fighter” and he mock-ingly but correctly pointed out that the designers of the S-37 have much “heavy and creative work” ahead of them before their aircraft will be a true fighter. Sukhoi has definitely won the first round of the publicity race, but ANPK MiG could have also flown its aircraft with a temporary engine and empty interior much earlier — had it wished to do so. In December 1994, the MiG 1.44 made its first high—speed taxi trials. However, the policy of the MiG company over the years has been different to that of Sukhoi. Assuming that an aircraft in the class of 1.44 has little chance of being exported, the company is not interested in investing its own money in it and so development work is limited by the funds granted by the Russian Ministry of Defence. In summer 1997, the Russian defence minister Igor Sergeyev promised that the money for completing the con-struction and beginning flight tests would be granted within several months — although these months passed and no money appeared. Now, after the spectacular step of Simonov, perhaps the 1.44 will also move ahead. Another unanswered question about the S-37 concerns the 'S-37’ designation itself. It is somewhat confusing that the designations Su-37 and S-37 have been assigned to two successive fighters which are quite different from each other. 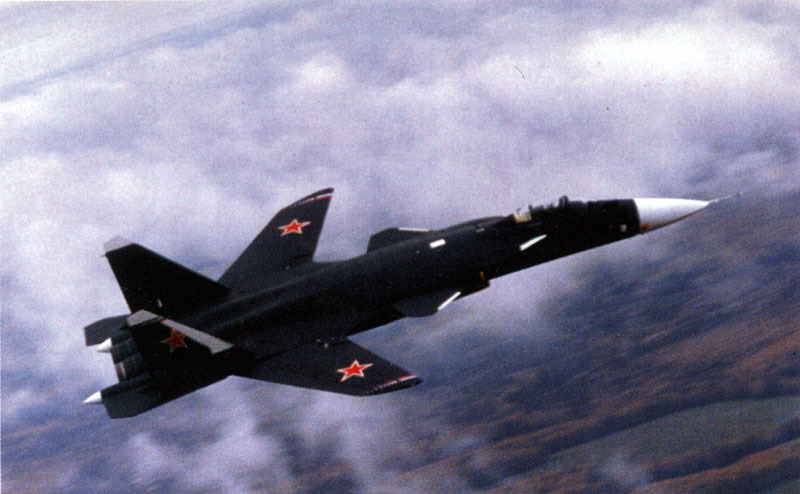 S-32, the former designation of today’s S-37, was used 30 years ago by Sukhoi for its Su-17 fighter. Su-32 (not S-32) was also applied, for a period, to the piston-engined trainer that became the Su—49, and is now applied to export versions of the Su-27IB (Su-32FN). There are also two S-54s. Apart from the current light fighter, this designation was also used for the Su-17M4. Neither is the S-37 designation new — it was used for a multi-role fighter aircraft designed for Warsaw Pact use in the early 1980s, by Vladimir Babak, who is now the president of Sukhoi Shturmoviks consortium established in 1992. This firm continues the develop-ment of the Su-25 and Su-39 attack aircraft and is working on other aircraft designs. Relations between Mikhail Simonov and Vladimir Babak have been described as ‘not too friendly’ and on several occasions Simonov ‘took away’ the names of Babak’s aircraft. For example, when Babak named his Su—25T attack aircraft as the Su-34, Simonov immediately assigned the same to the Su-27IB. When the Su-25T received the successive designation Su-39, Simonov used the same name for the Su-32 trainer (but only for a short time, as, soon afterwards, this aircraft was renamed Su—49). A similar conflict has now arisen with the S-37. In spite of several years of silence in the press, Babak’s S-37 project is still being developed by Sukhoi Shrurmoviks in the form of its ‘237’ aircraft (2 stands for two engines) — quite a different animal from Simonov’s S-37 which sur-prised the whole world, that grey day in Moscow. "